Take 1 tbsp of oil in a pan.When hot add panner and fry until panner changes it colour.Remove panner and add cauliflower,capsicum,carrot and beans in the same oil.Toss them on a high flame until they change colour and semi soft. In a another pan,take the rest of the oil.When hot add onions and green chillies.Fry until onions change colour but not fully fried. Add tomatoes.Cook until tomatoes are soft.Then add coriander powder,cumin powder,turmeric powder and red chilly powder. Mix well.Now add all the fried veggies and panner.Mix gently. Sprinkle salt and ginger juliennes. Mix well and toss until oil appears on the side of the pan. Garnish with fresh coriander leaves and serve with paratha. Lovely fry! It's hot and spicy! 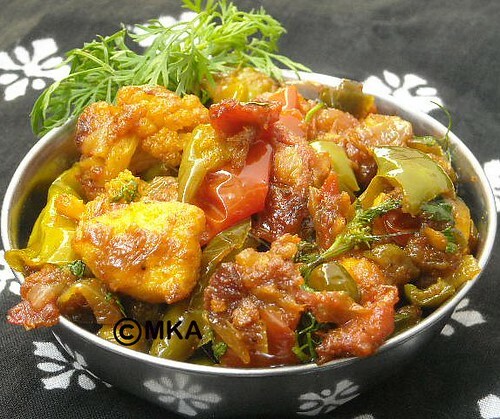 Slurp, fingerlicking vegetable fry,simply inviting..
wow so tempting and yummy curry !! delicious combination of veggies !! Excellent fry. Looks awesome. Can't resist drooling over it. 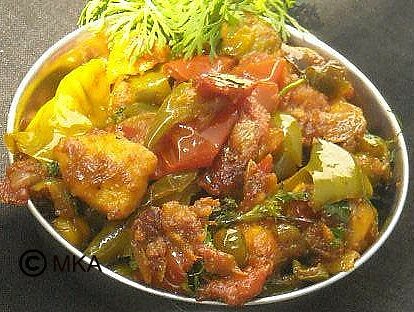 Mixed vegetable fry looks delicious. good to see your lovely recipe...I've come here after a long gap :) great vegetable medley! superb with rotis. very nice presentation and delicious vegetable mix. Amazing photography. Looks spicy and awesome. Mixed vegetable fry looks scrumptious. Thanks for this recipe. I have prepared a similar recipe as well.